Well I can. I am very much a creature of habit and the idea of messing with proven favorites makes me nervous. As if eating a not perfect meal is going to ruin my life. He was a professional body guard in Australia. How crazy cool is that? So Kevin Costner! And then meet Jo (his Whitney Houston in my mind) an events planner. More of a person who critiqued food rather than prepared it. But after you eat at Mesa…you’ll find that she’s got serious cooking skills. Here is their spot. Some shaded outside seating where at lunch time, you can watch 10,000 kids do their thing across the street at the RC School. And the sign. This building is often referred to as the Seaduced building. 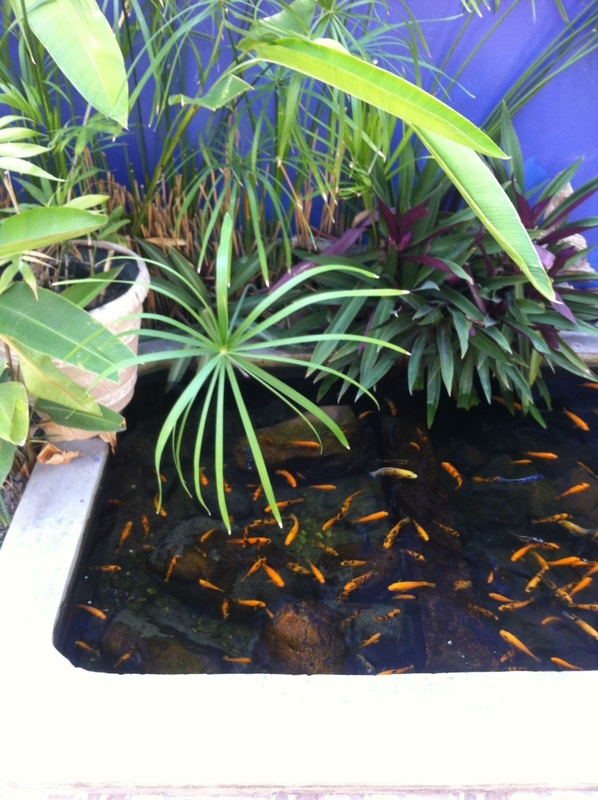 The building has the only real outside fish pond that I’ve seen in Belize. It’s always a surprise to me. 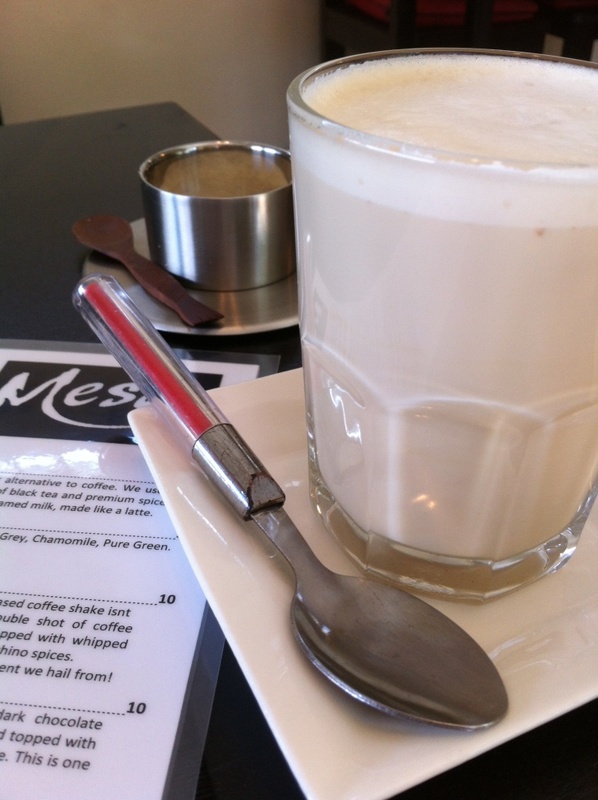 Mesa has both serious coffee menus and a food menu. Lots of vegetarian options. They’ve also got beautiful Air conditioning. Perfect on those really hot days. Seems to be the only kind of picture that I can properly take with my IPhone…close ups. Coconut French toast? 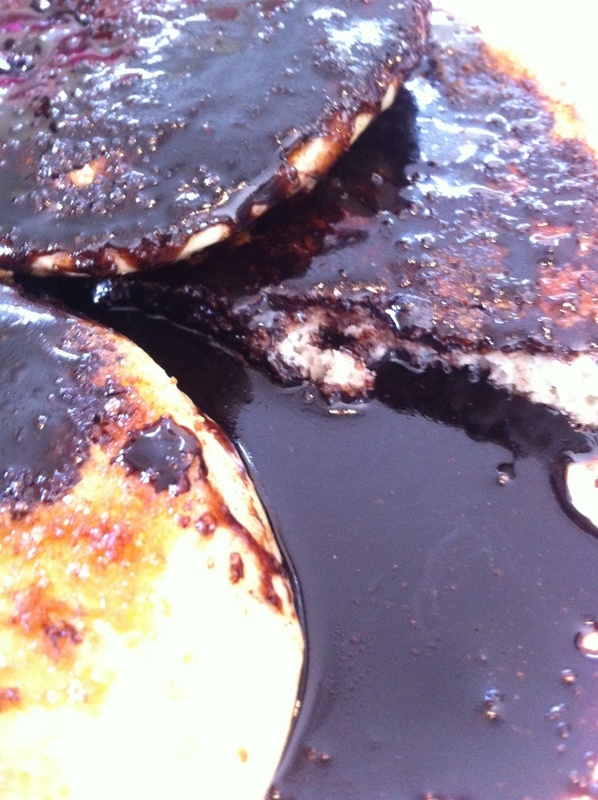 Choc-Churro Pancakes???!! A couple next to me was raving about the eggs. Hard boiled, wrapped with sage sausage, a bit of cracker crumb? I wasn’t 100% picturing it but I thought I’d give it a go. 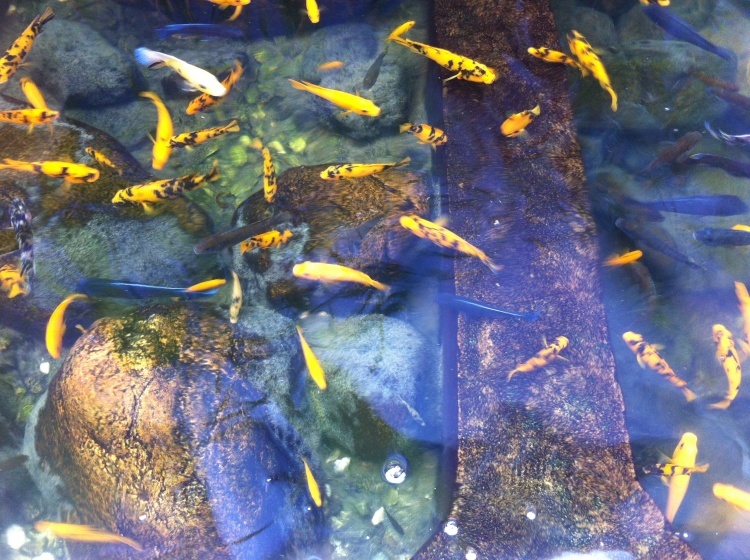 Odd certainly – though Jo told me that in Australia, these are quite popular. But so is Kylie Minogue and Vegemite. 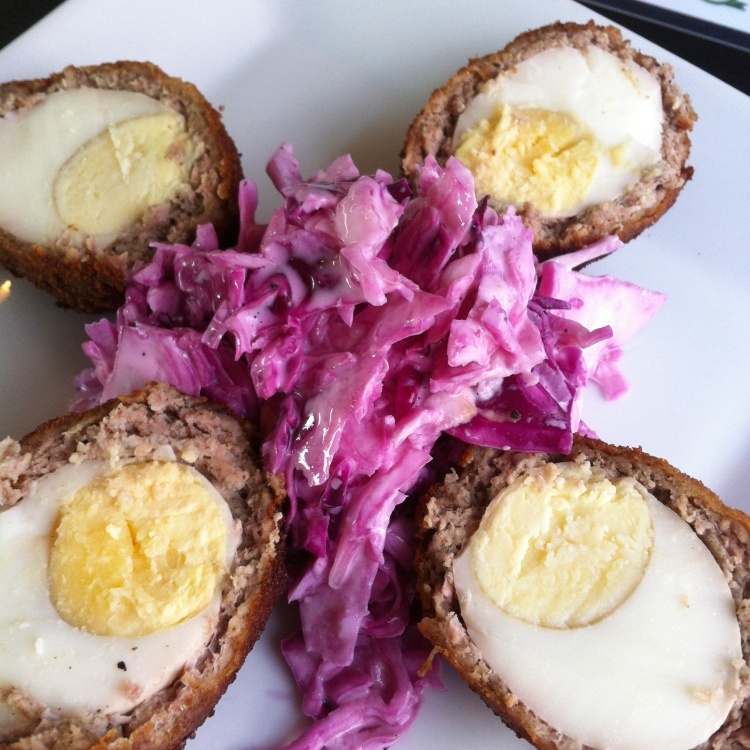 These “scotch eggs” are delicious. Rich egg, extra sage-y but not overpowering sausage and the crispy shell are good. But pair them with the very vinegary red cabbage slaw? You’ve made me a huge fan. What a tasty food. 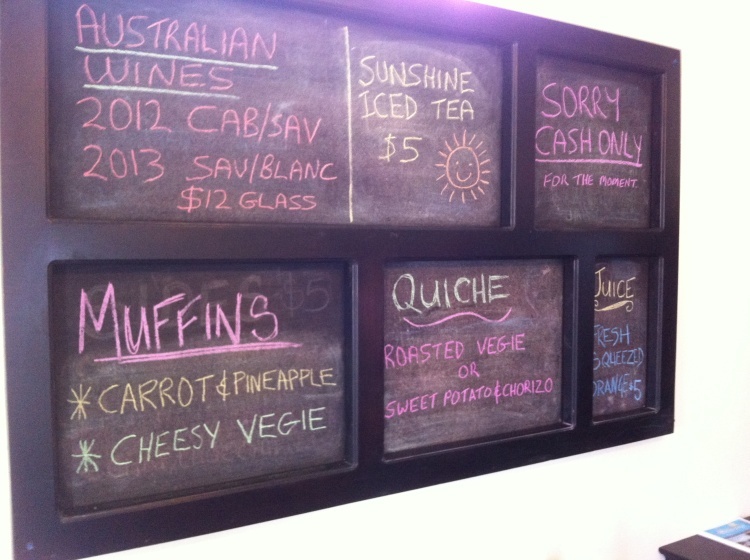 I need to come back for quiche and those hotcakes for sure. And why wait? 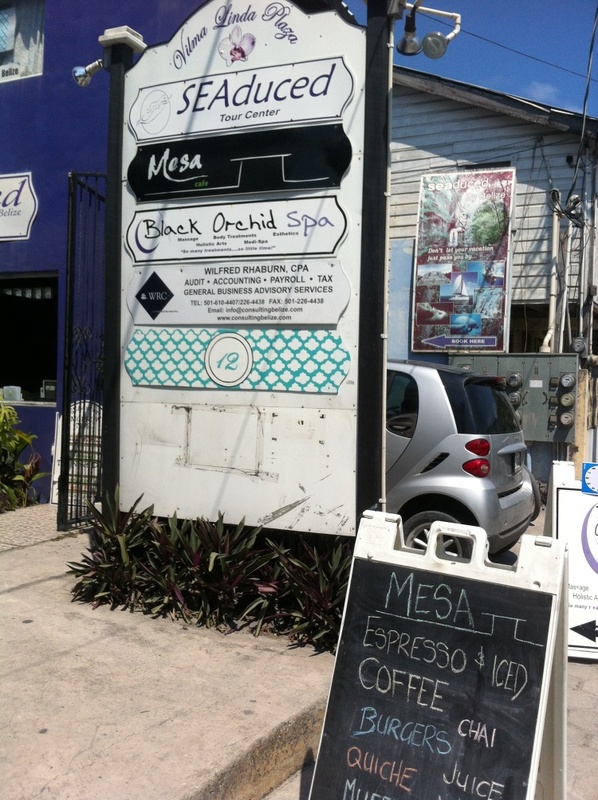 I showed up at Mesa Cafe the next morning and brought a friend. This time I ordered a chai latte from the extensive coffee and tea menu. DELICIOUS. 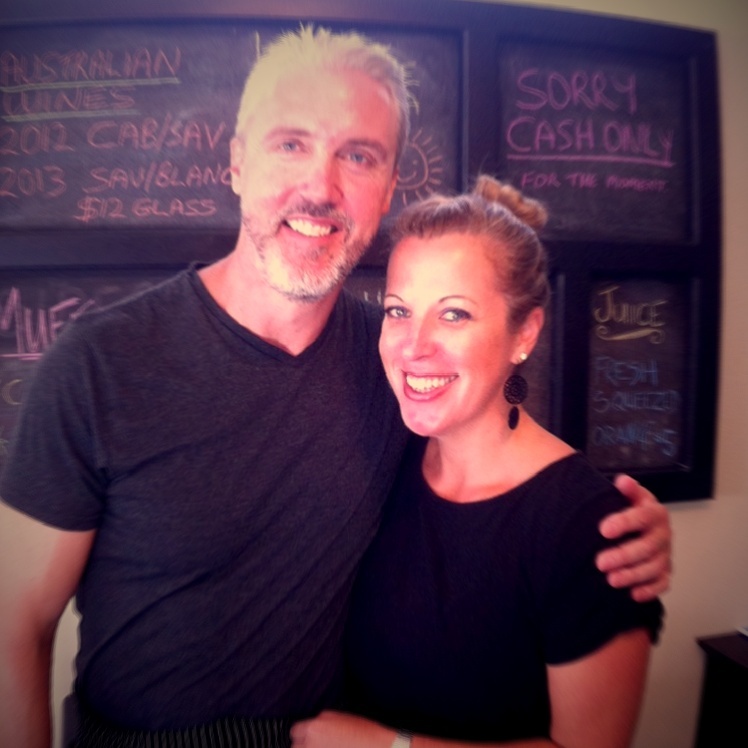 My friend Lynn tried the “Flat White” – ANOTHER Australian thing – and loved it too. 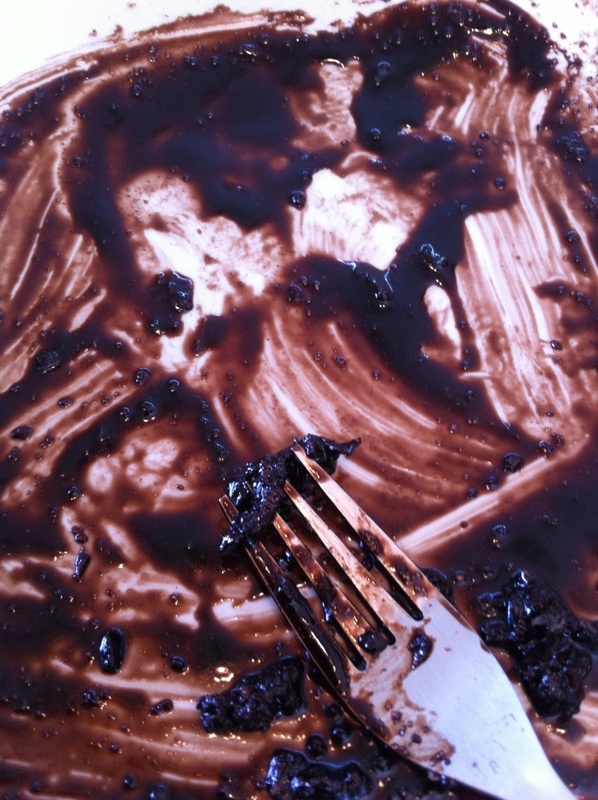 Thick THICK not-to-sweet pancakes sprinkled with crunchy cinnamon sugar and then drenched in dark chocolate syrup. Heaven in my book. 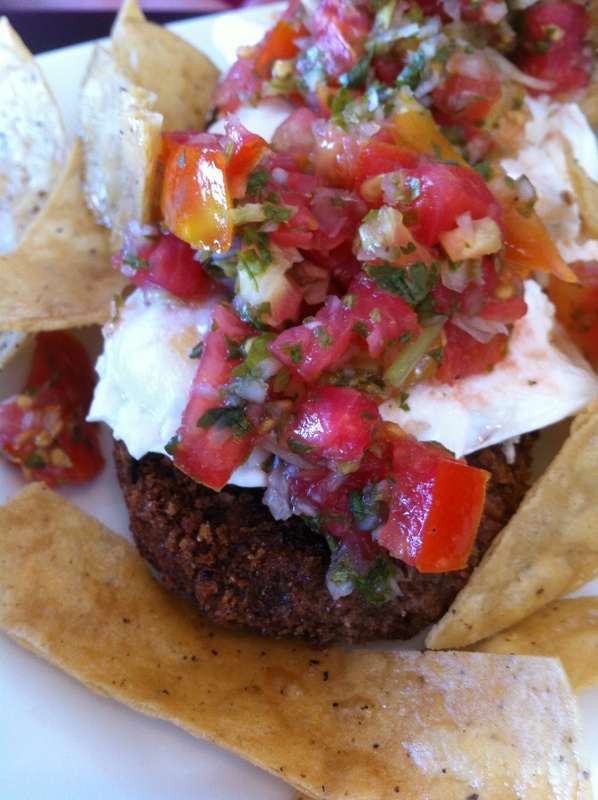 Lynn tried the Black Bean Benny and it too was delish. 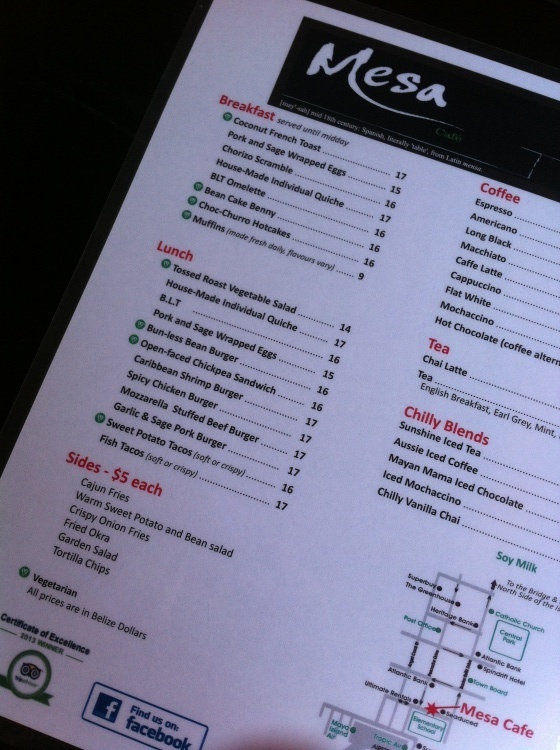 Chips fried to order, a creamy inside/crispy outside bean patty, poached eggs…I know you will like this place. 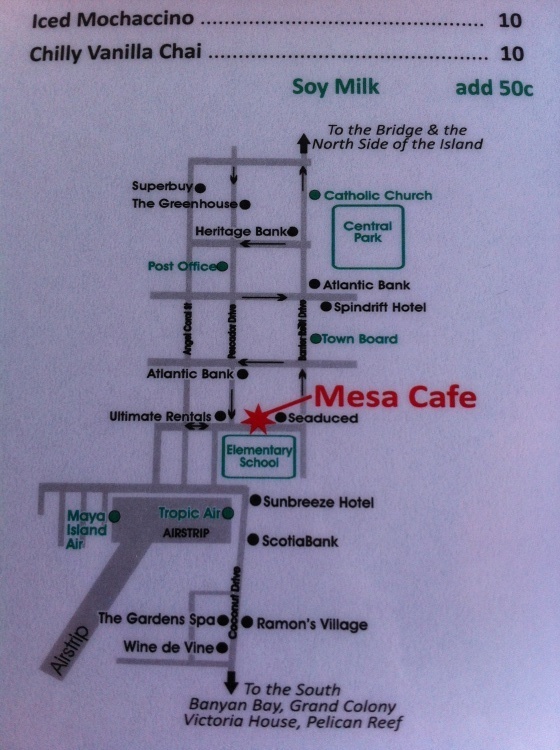 Mesa Cafe is open Monday thru Friday 8am to 2pm for breakfast and lunch. They serve beer and wine. Stop in. 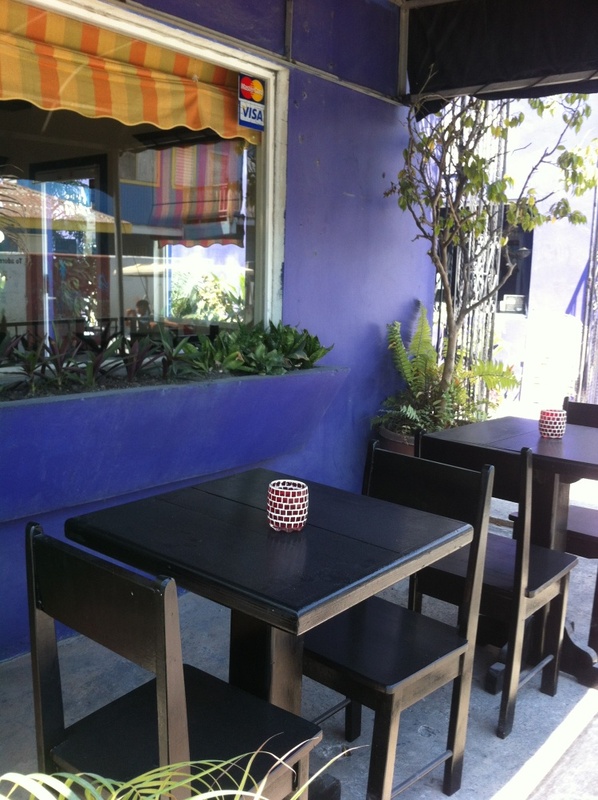 The menu is something new and fresh in San Pedro and I will be back. Many times. I love this food. And I know what you are thinking. But my new REAL camera is here in only 4 days. I, for one, can not wait. OMG, that food look amazing! Possibly worth flying down from the US for. I remember Mesa being open when we were there, but not with these owners. Looks VERY promising!